“Under the streets of London there’s a place most people could never even dream of. A city of monsters and saints, murderers and angels, knights in armour and pale girls in black velvet. This is the city of the people who have fallen between the cracks. There’s something so special about authors narrating their own books. They’ve created these characters and worlds out of their own imaginations, weaved together these words to make the phrases and passages that we relish and read over and over again. Not all authors possess the vocal performance skills that professionals do, but that’s beside the point. Authors know their stories better than anyone else; they know the core of it, what it looked and sounded like in its fledgling stage before it left the editing nest. They’re familiar with the nuances of each character’s personality, with the tone in which they would say each piece of dialogue. My appreciation for authors who narrate their own audio books has soared since listening to Neil Gaiman read his stories, and his novel Neverwhere has certainly contributed to this adoration of mine. I listened to the audio book version of Neverwhere and Gaiman’s narration is flawless. He has such a great reading voice (the accent surely helps!) and he does very different voices for all of the characters. His enthusiasm for and connection with the story as its writer is apparent in his performance, convincing me that more authors should try narrating their own books. Although quite dark and twisted, Neverwhere nevertheless has Gaiman’s signature charm. Richard Mayhew is a main character who is easy to relate to and difficult not to support. He’s an average, practical man simply trying to live a normal life, yet Gaiman manages to transform his world into something beyond his wildest imagination. London Below is such a terrifyingly mysteriously, savage place and is brilliantly reflected in the characters found there. Croup and Vandemar are ridiculous and creepy at the same time, providing as much fright as genuine entertainment. I absolutely loved the voices that Gaiman uses for the two of them, and consequently they are on probably my favorite characters. Are they horrible people? Definitely! But they are so outrageous that you can’t help but look forward to their next scene. However, these two madmen are not outliers- each character is well worth meeting and spending time with, because you never know what they’ll say or do next. In addition to the delightful characters, the setting of this story is also quite remarkable. London Below is a bizarre place filled with unexpected creatures, sights, and sounds. It sent a shiver down my spine on a number of occasions, and caused me to wonder how on Earth Gaiman creates such an odd world! The plot also reflects the rather random, haphazard design of London Below. Throughout this story I earnestly tried to predict the ending, but my efforts were proven futile. The actual conclusion surprised me in the best way, as did many of the plot twists earlier on. 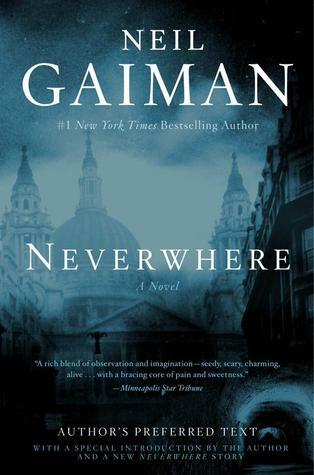 Overall, Neverwhere is a twisted yet strangely charming story oozing with British quirkiness, cleverness, and wit. While I do feel as though I enjoyed The Ocean at the End of the Lane more, this novel is still an excellent example of Gaiman’s talent for storytelling. It’ll make you laugh, voraciously flip the pages, and check under your bed twice before turning off the lights at night. What more could you want? Would I recommend it to a friend? Yes! Especially if they are a fan of the fantasy genre, British humor, or stories set in London, England. Have you read this book before? What did you think of it? What other books by Neil Gaiman would you recommend? Let me know in the comments section below! YES YES YES! You’ve captured the feels of listening to the audiobook perfectly. Great job! I haven’t read this one yet but it’s on my list and I’ll try to get to it as it sounds amazing. Happy reading! Thanks! 🙂 This novel is definitely one wild ride! Happy reading! Neverwhere was my first Gaiman. I fell in love with his prose from the first page. BUT, did you know it was originally a TV show? That Neil Gaiman wrote? With Peter Capaldi (Twelfth Doctor) as the Angel Islington? The book was Neil Gaiman novelising his own work. FURTHERMORE it was a BBC radio play with James McAvoy as Richard Mayhew, BENEDICT CUMBERBATCH as the Angel Islington, Natalie Dormer as Door, and BERNARD CRIBBINS as Old Bailey. It is amazing and wonderful and you MUST listen to it. I also recommend Stardust the audiobook, another one Gaiman narrates. And American Gods. Because I always recommend American Gods.